When we pulled up to McGee's Landing in our air conditioned charter bus, it was apparent that we were in for yet another authentic Louisiana experience. The week had been full of them. In fact, we had just finished up a Cajun style breakfast at Cafe des Amis that morning, with their bountiful beignets and foot stopping Zydeco band, it was quite the experience. This Atchafalaya Basin Swamp Tour at McGee's Landing promised no less. One of the reasons I love Louisiana so much is because no one there seems to take themselves too seriously. Everyone is friendly, the atmosphere is laid back and visitors are always welcome. That is the vibe we felt walking up the ramp to sign in for our swamp tour. Boarding our pontoon type rig with Pop at the helm, we knew we were in for a special treat. For more than a decade, the Allemond family has been running Atchafalaya Basin Swamp Tours from McGee's Landing and people from all over the world flock in to experience one the country's greatest river swamps. As we head off into the swamp, Pop tells us of the cypress trees, and their struggle to survive. Gone are the aged cypress jungles that once covered this area. Rising water heights plus excessive harvesting of the trees has led to their smaller numbers. These indigenous water trees are now protected. It can take nearly 200 years for one cypress tree to reach maturity, so there is a long way to go in replenishing their numbers. The Spanish moss drapes from their branches like fine silk, and we learn that this moss has been exported from the area for years. In addition to being used in bricks to help build the area, it was shipped out of state to companies like Ford, who used it in the seats of some of his first cars. He would insist the moss be shipped in cypress crates, and then would take the crates apart and use them for wood in his early models too. Pop explains to us, that the Cajun's call this "Lagniappe," meaning something for nothing. As we travel further, we pass under the I-10 overpass and the remnants of the pilings which once held the first means of transportation through the area, the old railroad tracks. Deeper into the swamp we travel. There is a quiet mystery that lurks here, like you never know what you might come across. The quiet sneaks up on you, and has you drifting off to sleep, as you glance down at the murky water of the swamp and see the bright billowing clouds reflected back. "Bang, bang, clap." "Here gator, here gator." Pop tries his best to scare up a gator from the depths of the water as he stalls the engine near the banks, but it's a sweltering day, and the gators know better than us to stay out of the sun. On our return trip to the landing, Pop tells us of the gator hunting season. There are 35,000 permits released each year for gators to the land owners throughout the state. Hunters must bid on these tags, and generally the one who promises the biggest proceeds to the owner wins the tags. The season opens in September before the gators decide to hibernate. The females can lay up to 50 eggs per year, but only 15 percent of those will live past infancy. Still, you get the distinct feeling you are being watched from the water, and it is apparent there is no shortage of gators found in these swamps. Before we depart the boat, I am quickly reminded why I return to Louisiana again and again. Pop gives a heart felt thank-you for our attendance of the tour before parting with a saying his mom used to tell him. His final words are "A stranger is just a friend you haven't met yet." 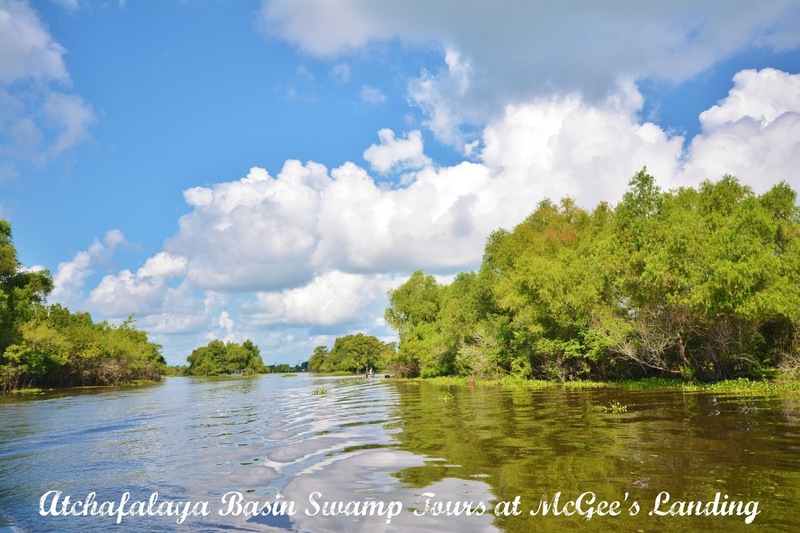 Daily Atchafalaya Basin Swamp Tours run from McGee's Landing at 10am, 1pm and 3pm. Tickets are $20 for adults and $15 for children under 12. If you are interested in learning more about McGee's Landing or the Swamp Tours, visit the McGee's Landing website for more information. Love the homey feel of that tour, Kathleen. Pop seems pretty awesome. I'm sad about the cypress trees though! They're so beautiful. He was really awesome Liz. It was sad. You could see all of the old stumps sticking up out of the water, just nothing new growing there. It is a lot like other things in the early days of this country though. I mean, look what happened with the buffalo. That looks like such a great tour. And, a fabulous day for it. Could you have asked for better weather? It was a gorgeous day. Absolutely sweltering hot and humid, but so bright and beautiful. This sounds like a fun trip. I'm amazed by how pretty everything is. It looked like a really nice day too! What a fun adventure! I lived in Louisiana for three months (during the time my husband was returning from deployment and getting things in order to move back home) but I didn't get to experience this side of it! Would have loved to do a tour like this. I'm sitting here, staring at the water, and hoping a gator doesn't pop up. I don't know if I'm brave enough to do it, but my kids sure would love it! I have been on main swamp tours, some in smaller airboats, and the gators have never offered to bother us. Most of the time they just slink off when they see you coming, sometimes they pose for photos lol. Oh my goodness! What a gorgeous place to visit! Absolutely beautiful...I bet the fishing would be great too. What a neat experience. I love the photos -- they are definitely not something you see every day! This sounds like such a fun tour! Pops would be fun to chat with! I never thought a swamp could be so beautiful, they obviously have a bad rap! I would visit that tour and enjoy every minute of it. I think they definitely get a bad rap. Of course, I am a firm believer that there is beauty in anything, but it definitely wasn't hard to find it here. What GORGEOUS photos! It sounds like an adventure-filled experience I'd enjoy! Beautiful!! Louisiana is on my list of must sees. The swamps and the history in them are so incredibly attractive. It is definitely a "must see" state. The boys and I have been, I have been alone, and we are all going back this December. There is so much varied culture and history there, that you never run out of things to experience. So fun! I haven't been on a swamp tour in LA, but I have in the Everglades. We've traveled over the swamp on I-10 for over 40 years on our visits to Biloxi from Houston. I always want to stop for a tour and will need to now that you've shared that it is worthwhile. The visitor's center at the I-10 rest area in the middle of the swamp is well worth a longer than usual stop. Their display is superb and kids will love the animated alligator, turtle, and other swamp beings. Plus, they have free coffee. Great to know Mamacito, we have never stopped there before. We will have to make an effort to when we return this December. The boys and I will be taking a three week tour of the state.